When complete coverage is needed for painting and sanding operations then the AKON automotive paint and sanding station is the solution. These enclosures are large enough for cars and trucks to pull into with enough room around them for equipment and associates to work. Featuring a clear 20 mil reinforced ceiling supported from above with a single cable attached to your existing structure. The paint prep station provides a contained environment which will allow the rest of your shop to remain clean from overspray and dust created from sanding. It is also an ideal solution to meet new guidelines for aluminum auto body sanding operations. Installing the prep booth enclosure is quick and very easy. You will find that the track hardware bolts together in a modular fashion and then the roller hooks are inserted. Once the track is assembled and hung you can now easily attach the prep station curtains via the grommets located at the top of the curtain. Then hang the clear ceiling curtain and Velcro its perimeter to the track. Quick and Easy! 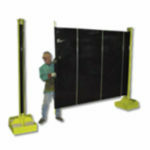 The automotive paint and sanding station curtains are made from a slick material much like a shower curtain. The material can be easily wiped off when it becomes dusty and washed down when it becomes dirty. If the paint shop curtains become really dirty you can wash them down further with a cleaning agent. The curtain wall material is also mildew proof and resistant to most chemicals. In addition, if they become torn from a sharp object we offer clear patch tape to repair the rips. Aluminum dust is now part of new car frames and dealing with that dust is a critical consideration for auto body shops. The processing of these aluminum body cars and trucks requires a completely sealed off area. 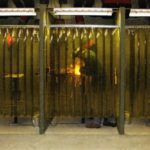 Our aluminum repair enclosure curtains will enclose these work areas where grinding, sanding, and prep work is taking place. Keeping the rest of the shop clean. 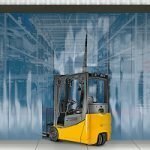 The AKON body shop curtains can also include 4′ x 4′ filter panels to allow for negative pressure generated inside of the curtain enclosure due to ventilation systems. These replaceable curtain filters Velcro onto the curtain and can be replaced if and when they become too clogged to function. They keep your air clean and safe for the environment.